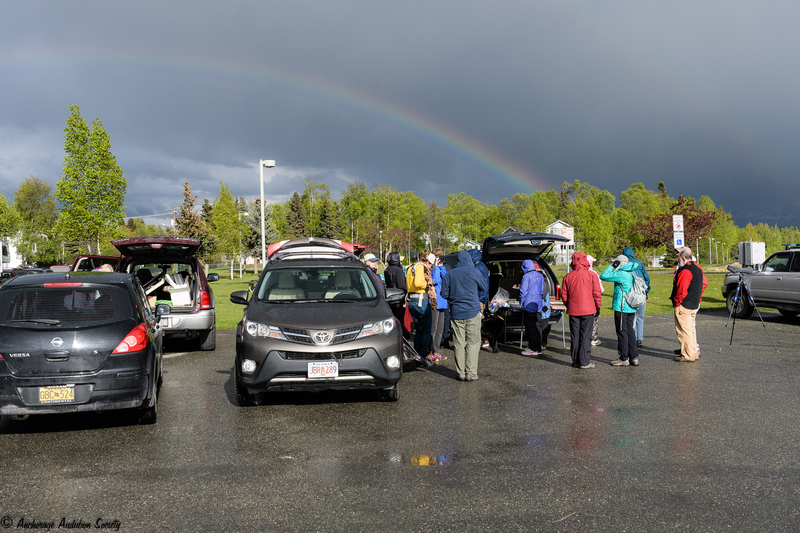 Because Spring Birding is at it’s peak, Anchorage Audubon has decided to CANCEL our regular third-Thursday monthly program at the BP Energy Center and have a party instead. It’s a potluck, a chance to tell birding lies, and a chance to casually stroll around the Westchester Lagoon area with other birders looking for new arrivals. PLEASE NOTE that we’ve pushed the date back one week because the weather is totally guaranteed to be warmer. We will also feature our Spring Pro-Am Birding Tournament. Experienced birders will pair up with inexperienced birders for a 30 minute contest to find the most species on Westchester Lagoon. The time goes by like lightning, and it’s always a treat to see what can be found in a very short period of time. 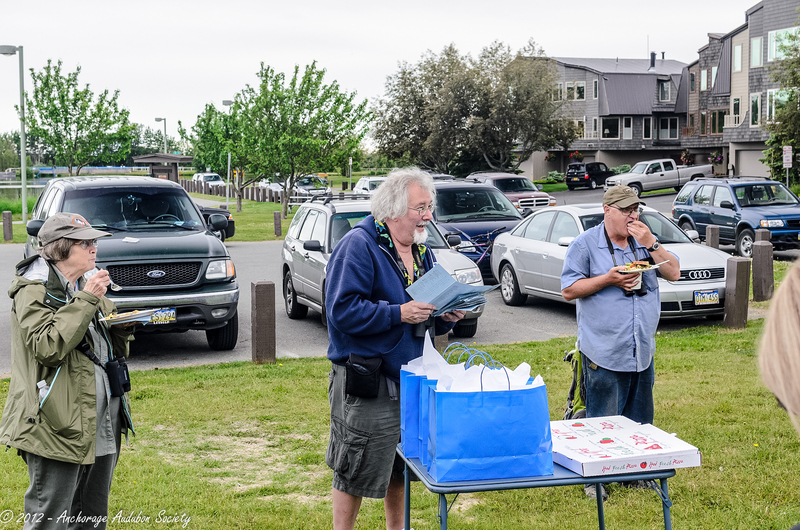 Bring a dish to share, tales to tell, binoculars, and gear appropriate for the day’s weather. We’ll bring plates, utensils, and Audubon Society approved napkins for sloppy eaters. 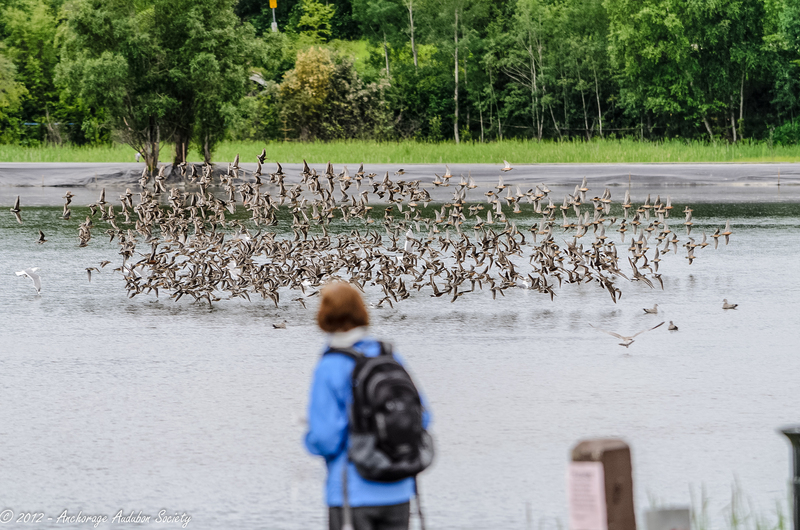 Last Thursday’s Westchester Lagoon Pro-Am Birding Challenge was a fabulous success! It was hailing 5 minutes before the potluck started, but it stopped by the time the first pizza was consumed. When it was time to Bird, the sun was shining. It was a fabulous Spring Day in Alaska! 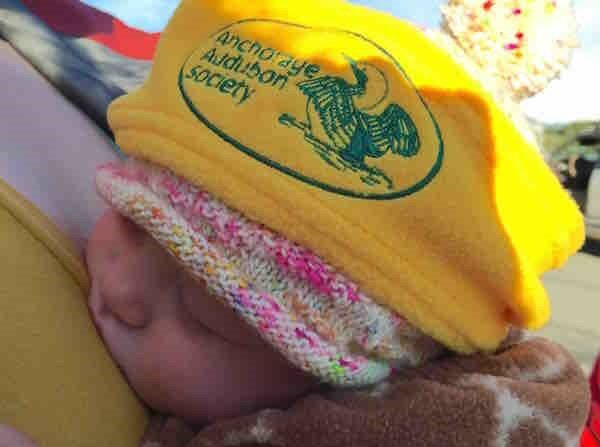 Twenty nine intrepid birders were in attendance including Cadia who is possibly the youngest birder ever to show up at an Anchorage Audubon event. Cadia – The youngest (undocumented) ever birder at an Anchorage Audubon Event! Louann’s Team crushed the competition with 21 species found in 30 minutes. Second place was an 18 species tie between Trapper Dan’s team and the Big Sit Team led by Dianne Toebe and Keith Confer. Any day that includes birding, pizza, competition, AND a rainbow has to be a great one! The Big Sit Team tied for 2nd without even moving from the starting point! We hope to see you at This Sunday’s Smackdown for an even more serious competition. Twenty nine intrepid birds are all smiles as they brave the elements. 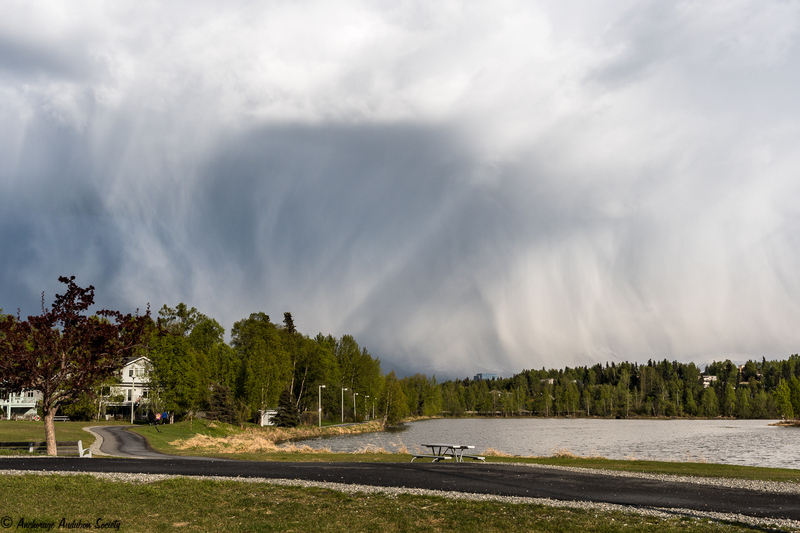 Weather ranged from hail to rain to sprinkles to sunshine and to this odd weather phenomenon. Thursday evening, May 26, Anchorage Audubon presents one of our favorite yearly events. It’s a potluck, a chance to tell birding lies, and a chance to casually stroll around the Westchester Lagoon area with other birders looking for new arrivals. This replaces our usual monthly indoor meeting, and it’s a chance to get outdoors with your birding pals—-but wait–there’s more! After we’ve devoured everything on the potluck tables, we’ll choose up sides. Experienced birders will lead teams of less-experienced birders, and they will have 30 minutes only to scour Westchester Lagoon. Prizes will be awarded to the teams that find the most species in only 30 minutes. It’s a birding sprint, and everyone is invited! Saturday, July 07, Anchorage Audubon met for one of our favorite yearly events. 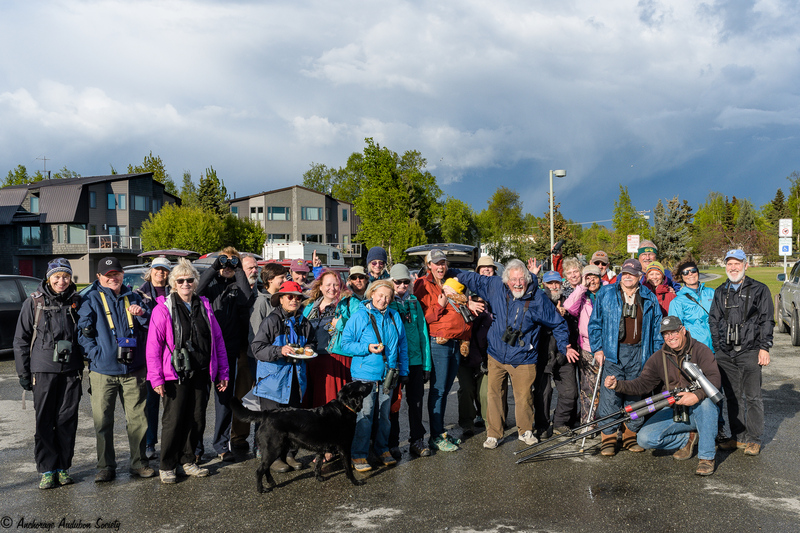 The Westchester Lagoon Potluck Party and Pro-Am Tour, to tell birding lies and casually stroll around the Westchester Lagoon area with other birders looking for new arrivals. After everything was devoured on the potluck tables, we choose up sides. Experienced birders lead teams of less-experienced birders, each having 30 minutes only to scour Westchester Lagoon. Prizes were awarded to the teams that found the most species in 30 minutes. It was a birding sprint, and fun was had by all!